American Beef Genetics . . .
Irish Black and Irish Red cattle are developed to carry genetically dominant traits desired by the U.S. beef industry. The Irish Black or Irish Red is of well-balanced conformation and superior performance suited for the purpose of efficiently and consistently producing quality beef. To provide beneficial services to promote the economic well-being and satisfaction of Irish Black® Cattle Association members and their customers. To record and preserve the pedigrees of Irish Black® and Irish Red® Cattle, while maintaining the quality, value, and integrity of the breed. To develop programs, materials, curriculum, advertising, marketing, and publicity that will best promote the interests of Irish Blacks® and Irish Reds®. To further the use in the American beef industry of Irish Black® and Irish Red® seedstock by progressive cattle producers. The Irish Black Cattle Association is the Official Breed Association of all Irish Black and Irish Red Cattle in the United States. It is a not for profit member based association. 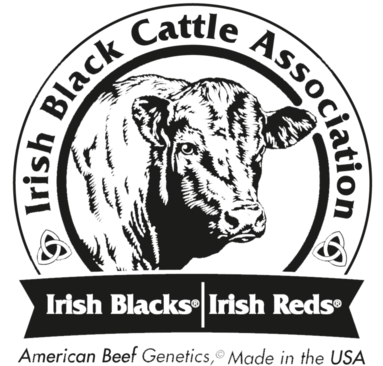 The Irish Black Cattle Association is licensed by the Irish Black and the Irish Red Trademarks as the sole American Breed Association for Irish Blacks and Irish Reds. BUYERS NOTICE: BEFORE YOU BUY!